Fifteen students graduated from Northeastern Technical College's Nursing Assistant (NA) Program on April 11. The program consists of 80 hours of classroom instruction and 40 hours of supervised clinical training and is offered by the college's division of continuing education. 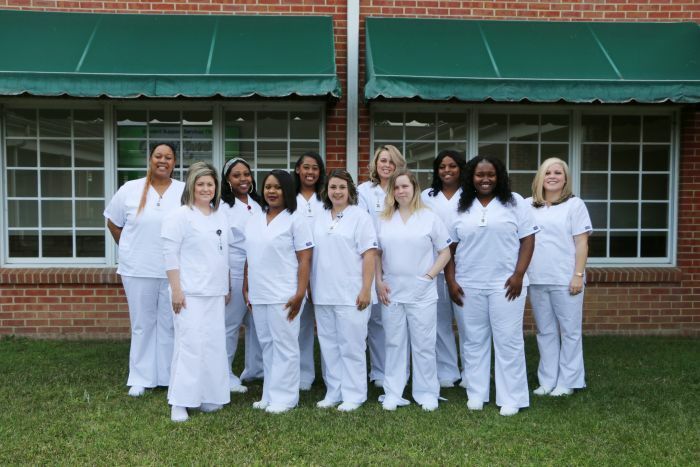 Nursing assistant graduates include Quantiece Campbell of Bennettsville, Rochell Coit of Bennettsville, Leatha Cue of Patrick, Haley Denham of Patrick, Khaliyah Ellerbe of Cheraw, De Andrea Fleming of Cheraw, Ericka Jordan of Pageland, Tisheonya Kollock of Bennettsville, Mekia McNeal of Pageland, Victoria Scott of Chesterfield, Kayla Sterrett of Cheraw, Lauren Tucker of Jefferson, Crystal Vasser of Ruby, Alyssa Woods of Cheraw, and Brandolyn Brown of Cheraw. Upon completion of the course, graduates acquire the academic and practical skills necessary to successfully complete the Nursing Assistant Certification Exam. This exam is required by the S.C. Department of Health and Environmental Control for employment as nurse aides and certified nursing assistants (CNA). The CNA pathway program is offered during the day and evening every semester at Northeastern Technical College. The day class option lasts approximately eight weeks and the evening class option lasts approximately 15 weeks. Individuals with SNAP benefits qualify for almost 100% scholarship funding through the SNAP2Work program. Registration for these classes is completed by taking the WorkKeys, "Workplace Documents Test" and scoring a level 3 or higher. The process is continued by filling out a continuing education registration form, and paying the tuition fee. This may be done at the Allied Health – Nursing Department office, located in the John West Building on the Cheraw campus (Building 800) Monday through Thursday from 8 a.m. to 5 p.m. and on Fridays from 8 a.m. to 1:30 p.m.
For more information about admission, or the CNA pathway, please call the office of Allied Health - Nursing at (843) 921-6984 or 1-800-921-7399 and choose option four (4). Pictured above are the Nursing Assistant students who graduated Northeastern Technical College's certificate program on April 11. Front row, from left: Lauren Tucker, Mekia McNeal, Haley Denham, Kayla Sterrett, and Tisheonya Kollock. Back row, from left: Victoria Scott, Khaliyah Ellerbe, Alyssa Woods, Quantiece Campbell, and Crystal Vasser. Not shown are: Rochell Coit, De Andrea Fleming, Ericka Jordan, and Brandolyn Brown.